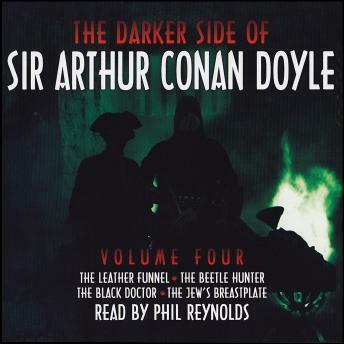 The Darker Side Of Sir Arthur Conan Doyle. Volume 4. Most famous for his tales of crimes and deduction, Sir Arthur Conan Doyle also had a passion for suspense, the supernatural and the macabre as demonstrated in this collection of gothic short stories. The stories featured in this volume include: The Leather Funnel, The Beetle Hunter, The Black Doctor and The Jew's Breastplate. So get ready for Doyle's vivid spine-tingling imagination to unnerve and thrill you in equal measure! Sir Arthur Conan Doyle (1859-1930) - Inspired by Sir Walter Scott, Robert Louis Stevenson, Edgar Allan Poe, Guy De Maupassant, and Emile Gaboriau, Arthur Conan Doyle's now iconic mastermind sleuth and his companion Dr. John H. Watson redefined the detective genre. Conan Doyle's medical training under Dr. Joseph Bell was the foundation for Holmes's methods of deductive reasoning. Sherlock Holmes first appeared in A Study in Scarlet in 1887 and Conan Doyle would write fifty-five more stories and four novels starring Holmes. He wrote many other notable fiction and non-fiction works including The Stark Monro Letters (1895), The Exploits of Brigadier Gerard (1896), The Hound Of The Baskervilles (1902), The Lost World (1912), The Coming Of The Fairies (1922), and Memories and Adventures (1924-30), many of which have been translated to dozens of languages and are still in print today. This production is read for you by Phil Reynolds. Phil is an experienced actor, director, writer and voice artist, with recent stage roles including Martin Dysart in Equus, Mike in The Memory of Water, Jim in The Weir and Alan Turing in Breaking the Code.